God’s names tell us who He is, what He is like, and what He does. 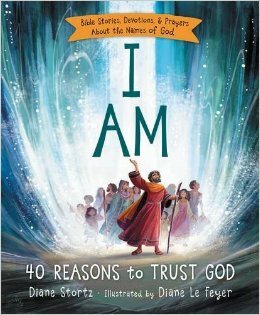 This beautiful book covers 40 of the Bible many names and descriptive titles for God, Jesus, and the Holy Spirit. When I first saw this book, I knew I wanted to review. The cover was gorgeous and the idea for this devotional was unique. It's taken me a little longer to get through this book, but only because, I decided to let my kiddo read it and let me know what she thought. When my mom saw the book, she decided she wanted to use it for my kiddo's Bible class. So every day for the last several weeks, my littles has read this book. This first thing the kiddo told me was how pretty all the pictures are are so pretty. My mom said that the kiddo loved to look at the pictures as they worked on the devotional. They kept her attention through all of Bible. As time progressed, my kiddo would start telling me about the new names of God she had learned, but not only that, but the Hebrew way of pronouncing them. She loved learning about the names and the stories that corresponded with it. My mother even enjoyed learning Hebrew. This devotional has been fantastic in offering more insight in to the Bible, plus also offering many different areas of learning. The illustrations are stunning, the Biblical insight and verses are great for kids. I honestly can't recommended this book enough. Thank you to Booklook blogging program, I received a copy of this book for free in exchange for an honest review.